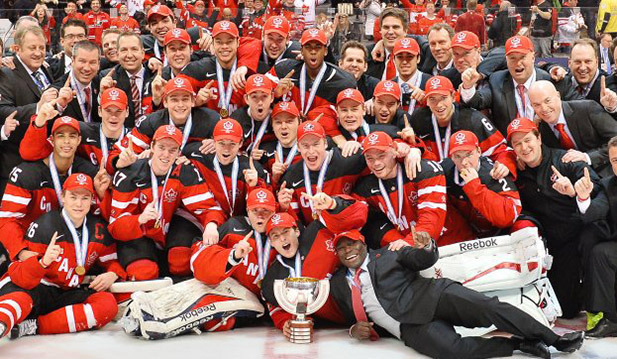 Philadelphia Flyers prospect Samuel Morin helped Team Canada to a 5-4 win over Russia to capture the gold medal at the 2015 World Junior Tournament on Monday night at the Air Canada Centre in Toronto. Morin’s gold marks the second time in the last three years that a Flyers defensive prospect has captured gold at the tournament with Shayne Gostisbehere winning gold with USA in 2013. It also marks the third straight year a defense prospect was awarded a medal as Robert Hagg took home the silver medal in the 2014 tournament with Sweden. In his first World Junior Tournament, the 6-foot-7 defenseman appeared in all seven games for Canada going scoreless and recording six penalty minutes, and a plus-minus rating of +3 with five shots on goal. Morin is in his fourth full season with Rimouski Oceanic of the QMJHL where he has nine points (2g-7a) in 12 games. He suffered a fractured jaw on Oct. 12 during his junior season that caused him to miss 13 games. The Flyers first round draft pick (11th overall) in 2013 played in five out of a possible seven preseason games for the Flyers this season, going scoreless but averaging close to 20 minutes of ice time per game, including over 21 minutes in three of those contests.